Coach's Corner - 1974-75 Phila. Flyers "Spectrum Hung" banner. Go Back to Lot List 1974-75 Phila. Flyers "Spectrum Hung" banner. 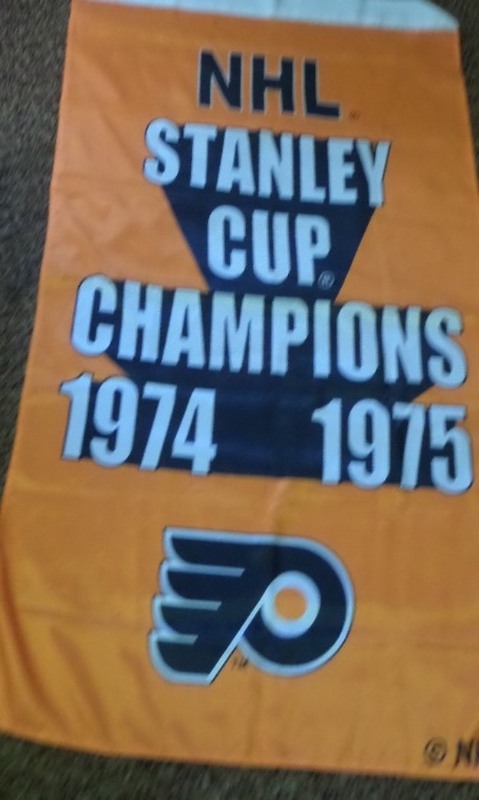 This $2000.00 one of a kind actually hung in the old spectrum and honors the 1974-75 World Champs in black, orange and white team colors. It is in like new condition, consigned by a Philly sports insider, and has grommets for YOU to hang easily as well. It is 5 FOOT long, belongs in every serious NHL or Phila. sports collection, and sells here with NO reserve.